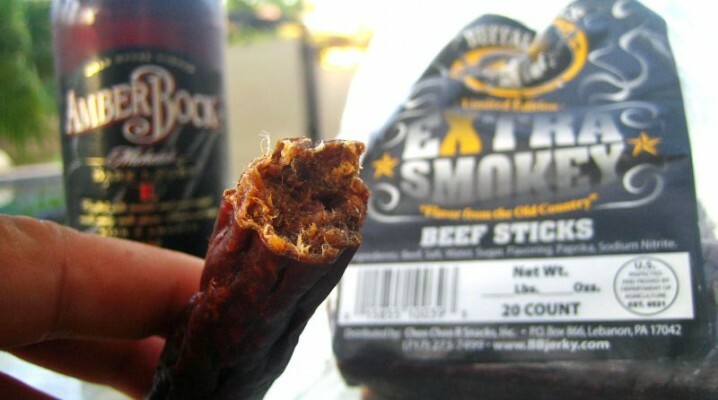 If you haven’t already tried these Extra Smokey Beef Sticks from Buffalo Bills, you might wanna. They’re are indeed “extra” smokey. They have a great smokey flavor to them, and a somewhat spicy flavor as well, though I don’t see anything in the ingredients list suggesting anything spicy. This even has some slight chocolatey notes to it, perhaps indicating something roasted, I dunno. 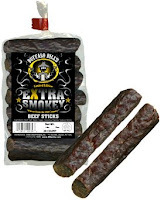 Unlike other meat sticks, these are very meaty. I mean, it’s almost like eating a stick of salami, where you can see the meat fibers pulling away as you bite off a piece. In fact, this has a rather dry taste to it, kinda like salami. 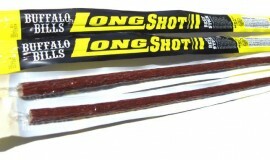 My only “beef” with these beef sticks is they’re rather salty. They’re not too bad in the first several bites, but when you towards the end, the salt wears me down. I need some swigs of drink, and about 10 minutes of rest, before attacking another stick. ottle cork, and about five inches in length. They might actually make a great cure for a hangover. im Jims in a variety of flavors. But when they sampled the Slim Jims, they about ralphed. No one else could finish their Slim Jim samples. One guy said it was eating “meat flavored toilet paper”. I mean, it actually did feel as if you were eating a chunk of toilet paper (not that I know from experience, mind you). Funny how the best things in life are not readily available. The worst stuff is always easily found at a convenience store, but the better stuff you have to order online. It’s just one of those things.